The domesticated cat’s diet would not normally contain fish and it should not be a part of their diets unless provided in balanced cat food. Consequently, cats do not normally eat goldfish. However, cats are genetically skilled predators and a vulnerable goldfish is no match for the wily feline. The popular belief that cats eat fish is difficult to get rid of. Fish have harmful toxins – harmful to humans and harmful to our 12-pound cats. The belief that cats should eat fish has also caused an undeniable surge in fishing and fish farming which can have a devastating impact on the environment. Then Why Are Cats So Attracted to Goldfish? Cats are attracted to movements of small, glittery things. Goldfish are no exception and the fact that they are living creatures is only icing on the cake for a cat with a strong hunting instinct. Any small creature is in danger of being picked off cleanly by the common housecat. Mice, hamsters, gerbils, birds, lizards, and bugs have all felt the pain of the cat’s paw swatting them into oblivion. Additionally, cats love to toy with their prey – they love seeing their prey squirm and beg for its life only to be smashed down once again by a forepaw. It’s not a lovely picture that’s being painted of your sweet cat but it’s just cat nature. A goldfish has all the makings of the perfect prey to your cat. It is small, has shiny scales, flits around invitingly, and it also looks incredibly delicious. Getting the fish out of its watery habitat is a fun puzzle for your cat to solve. If the goldfish is unlucky enough to be snared he will spend the last couple minutes of his life being pawed and torn asunder. Cats love seeing the goldfish jump around frantically – this is a bonus for them. What If the Cat Eats My Goldfish? If your cat manages to capture the goldfish its chances for survival are very slim especially if there is no human monitor in the home. Even if you can intervene your fish will most likely be irreparably harmed and may need to be put out of its misery in a humane way. In the event your cat eats the fish call your veterinarian. Eating a live, raw goldfish is not as harmless as you might think. Raw fish carry diseases – bacteria and parasites. Goldfish are carriers of tapeworms which most likely will be transmitted to your cat. Additionally, a small goldfish is still large enough to cause choking or possibly a bowel obstruction. If you make the decision to have a fish, you shouldn’t keep it in a small, open bowl under any circumstance – even if you don’t have a cat. Goldfish should be kept in an aquarium with a secure lid. The aquarium should be heavy enough that the cat cannot knock it over and the lid should be secure enough that the cat cannot remove it or break through it. It is perfectly acceptable to have different animals living in your home. Not keeping each one safe is unacceptable. Furthermore, allowing your cat to attack one animal will put the other animals at risk too. It’s best not to awaken the tiger inside your cat! 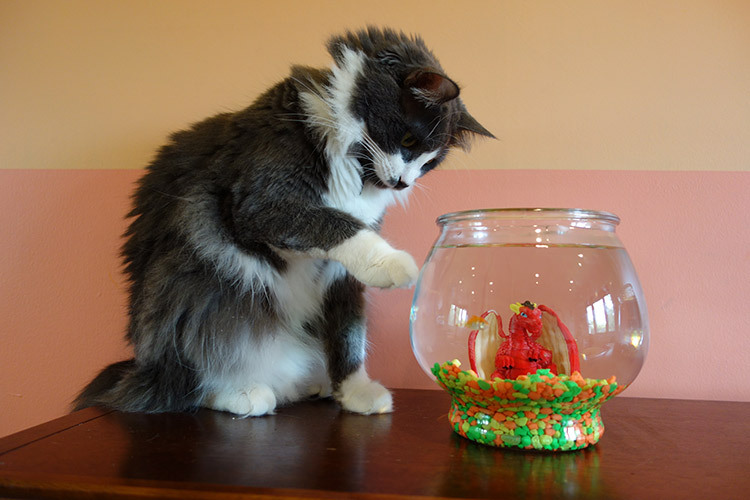 Ontario SPCA: How Do I…Protect My Goldfish From Cats?